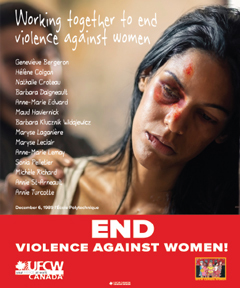 Violence Against Women Action Card - 5"x 6"
We also know that domestic violence impacts others in the workplace. Over 1/3 of coworkers reported their work performance suffered because of the stress they were feeling for their colleagues. 50% of all Canadian women experience at least one incident of physical or sexual violence in their lifetime, with devastating direct and indirect consequences. This amounts to decreased productivity conservatively estimated at $78 million annually in costs to Canadian employers. Important changes are happening in Canada and around the world. In June 2016, Manitoba became the first province to pass legislation for five days of paid leave for survivors of domestic violence, guaranteeing job security while they take time off to sort out their lives and find a new place to live. In Australia, numerous unions have negotiated contracts that give paid leave for victims of domestic violence. There is growing global recognition that the investment made by employers to support survivors and to protect jobs and workplaces pays strong social returns. 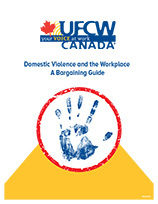 UFCW Canada supports the creation of legislation that assists survivors of domestic violence and provides them with paid leave, reasonable unpaid leave, and options for flexible work arrangements and guaranteeing job security while they take time off to sort out their lives and find a new place to live. Further, legislation should require employers to provide mandatory workplace training about domestic violence and sexual violence. Together, we can urge provincial governments to make paid leave for domestic violence survivors a reality for all workers in Canada. Send a message to your provincial government leaders today.